Thomas Zinyeka was born in 1972 in Masvingo Province. Thomas and his family are located in Gokwe North District of Zimbabwe. He is the sixth child in a family of 9. 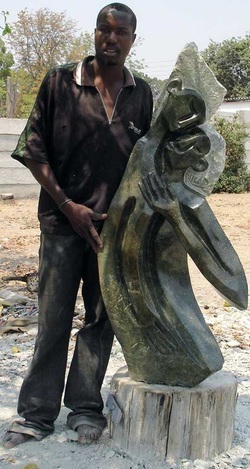 He completed his Secondary level at St Marys Mission in Chitungwiza in 1988 thats when he fell in love with stone sculpting after being inspired by his brother Gladman Zinyeka who was already an established sculptor by that time in 1988. Due to insatiable appetite with sculpting, attendance at School dropped resulting in Thomas stopping short at Ordinary level in order to devote himself fulltime in sculpting. Zinyeka loves to express his feelings on stone from deep down his heart on varying stones ie spring stone, opal, verdite, dolomite, fruit serpentine, just to mention a few. 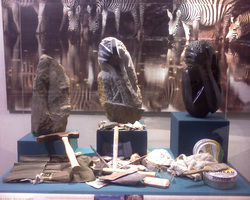 He enjoys o share his sculptural joy and miseries with other sculptors both within and outside boundaries. 2002. -Supported his peaces in Australia, Sydney at the touch of Mandela Gallery Opera House 2005. Thomas Zinyeka, brother of the late Gladman Zinyeka, created the finished sculpture which can be seen at the Atlanta ariport between the T & A concourse.